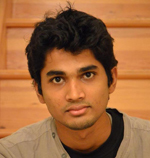 Roshan Dsouza received his MSc degree in Photonics from Manipal University, India in 2011. His masters project work at Raja Ramanna Centre for Advanced Technology concerned the “Development of Free Space Combined Optical Coherence Tomography (OCT) – Laser Induced Fluorescence (LIF) System”. He has been awarded the College of Science Fellowship from NUI Galway in September 2011.His current work involves correlation mapping OCT (cmOCT) imaging of the microcirculation and multiple reference OCT - a Compact Imaging project.